Build your own motorized vehicles and machines and control them with a wireless remote control unit. A unique six-button infrared remote allows you to control three different motors simultaneously, moving each of them forward or in reverse, with easy-to-activate touch sensors. The three motors can be combined to make complex vehicles and machines in numerous configurations limited only by your imagination. 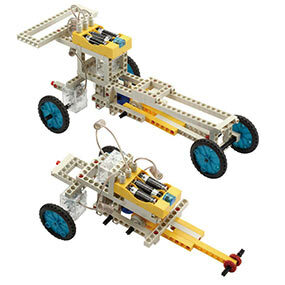 Assemble 10 models demonstrating different ways in which the motors can be used including a bulldozer, car, three-wheeler, crane, antique car, plow, folding car, formula one racer, three-blade dozer, and robotic arm. 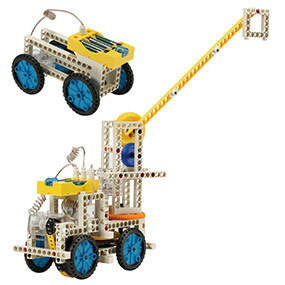 After you have built the models in the instructions, you can design your own remote control creations. 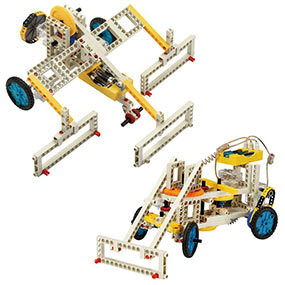 The kit comes with three motors, remote control unit, battery holder, and building blocks. 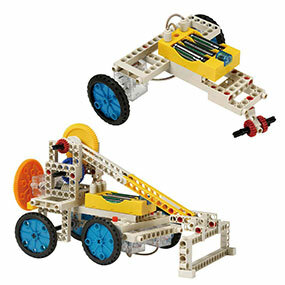 Collaborate with your fellow junior engineers to build fantastic and functional remote-control creations. 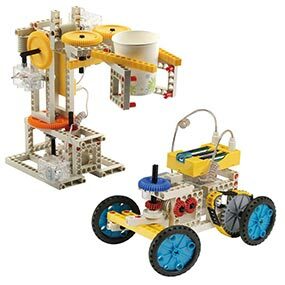 The 48-page color instruction book included in this kit gives illustrated step-by-step instructions for the models to help children learn through play and develop their mechanical understanding, creative thinking skills, and hand-eye coordination. The 182 building pieces included in this set are compatible with those in all Thames & Kosmos Construction Series kits, Physics Series kits, Wind Power, and Hydropower kits. Kit comes with everything you need.For any further queries please contact Thames & Kosmos Technical Support Number @ 800-587-2872 . TK 555004, 555004, THK-555004, Science/Educational, AZN-519, Plastic. 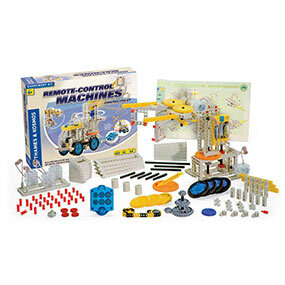 Be the first to review “Thames & Kosmos Remote Control Machines” Click here to cancel reply.